The range of applications of LED lighting continues to expand, with its excellent light adaptation, nearly no irradiation of infrared or ultraviolet radiation, and ecological characteristics such as long life and low power consumption. LED lighting emits intense light from light emitting diodes, as opposed to the conventional lighting typified by incandescent bulbs or fluorescent lamps, which emit light equally in all directions-360 degrees. Highly directional lighting equipment such as ceiling-mounted light fixtures allows you to implement structures that make the most of the light, whereas the difficulty of emitting light that is diffused evenly is regarded as a weak point of such lighting devices. When you can freely direct light with highly directional LED lighting, you can also diffuse the light in all directions, as a matter of course, which should lead to new applications of LED lighting. Minebea has launched the development of a lens for lighting that will be capable of skillfully controlling light. actually manufactured a collimating lens drawing on its optical simulation technologies, there was still room for improvement with respect to the attenuation of light. The light transmittance of the lens is also directly connected with the power consumption of the LED lighting. Can’t we further reduce the loss of light, and can’t we collect and diffuse light more efficiently? 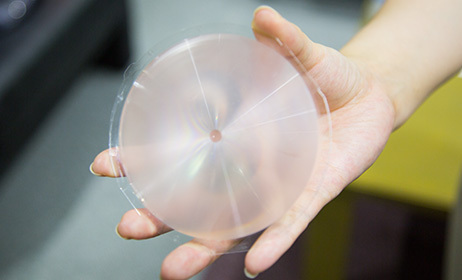 Minebea has ultimately achieved one of the solutions toward realizing the lens of the future by drawing on its specialty light guiding panel technologies to make a thinner lens. By arranging several optical lenses to carve a fine prism pattern, Minebea has developed a lens for LED lighting, having the thickness of only 1mm, which can skillfully control light. 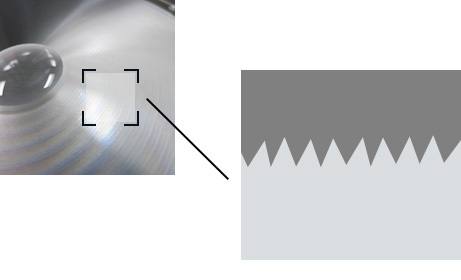 A thickness of 1mm has been achieved by carving an ultra-fine prism pattern on a thin plate. 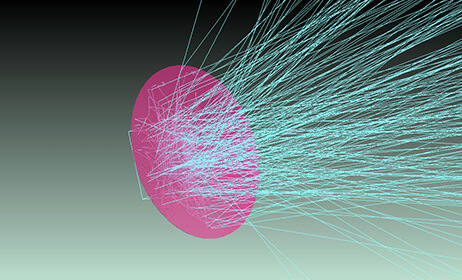 Minebea thoroughly investigated optical simulation in developing a thin lens with exhaustive optical simulation technologies. There was a need to calculate the patterns of ultra-fine optics (elements) using a thin lens to collect and diffuse light, which had conventionally been done with a thick lens. Toward that end, we conducted precise calculations of the reflection angle and attenuation rate in the lens countless time, applying the optical simulation expertise accumulated in developing an ultra-thin 0.3mm light guiding panel. Fresnel lens is used to perform fine adjustments in the center of the lens, which requires precise guiding control. In addition, carefully mixing the light in the lens allows you to consistently generate “high quality” light irrespective of the quality or quantity of the light emitting diodes. With respect to the lens development required for lighting applications, we have also achieved rapid development of lenses with a variety of optical characteristics, through the application of the most suitable optical designs developed by thorough optical simulation. 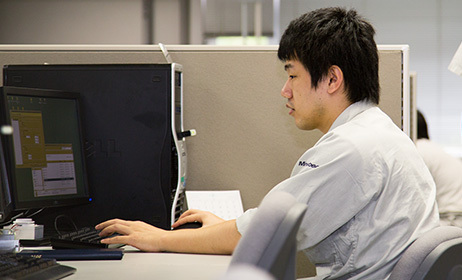 In terms of lens manufacturing, Minebea draws on its world-class molding and processing technologies. Making full use of the mold processing technologies cultivated in machining-including bearings and resin molding technologies cultivated in gear molding-Minebea created an unprecedented and epoch-making thin lens for LED lighting carved with an ultra-fine optical pattern. While LED lighting effectively saves around 60% of the energy compared to conventional light bulbs and fluorescent lamps, using this thin lens achieves an additional energy savings of about 30%. By adjusting the optical pattern of the lens, you can skillfully control the direction of the light, allowing for various combinations of light distribution and diffusion. If you use a thin lens in a street light that serves to illuminate the road, for example, you can control the direction of the light so that it illuminates only the road brightly. In addition to improving visibility on the road, it solves the problem of uselessly illuminating the surrounding buildings and the like as well. Features include not only directivity of the light, but also further enhanced diffusivity. By introducing a thin lens in illuminating the room, for example, you can create a soft light and in turn, a comfortable space. 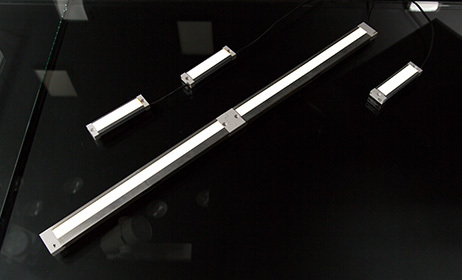 In fact, leading U.S. lighting equipment manufacturers are beginning to incorporate Minebea’s thin lens in lighting equipment focusing on design and using the unprecedented thinness and performance in a variety of fields.